There’s every chance that Arkoni has got you covered in style when visiting the new BroadStreetPlaza leisure venue in the heart of Halifax! The £40 million 280,000 square foot development was built by Marshall Construction of Elland on behalf of developers Gregory Projects and opened in the summer of 2012. It features a wide range of eateries, including Beefeater, Nando’s, Harvester and Pizza Express as well as a Vue cinema, a gym and a Premier Inn hotel. Arkoni designed, manufactured and installed glass feature canopies for the multi-screen Vue Cinema, 100-bed Premier Inn and an NHS building on-site to a total value of £122,000. The attractive canopies are comprised of a galvanised and polyester powder coated steel structure with an aluminium glazing bar system to carry the 17.5 mm thick toughened laminated glass panels. PPC aluminium gutters and downpipes were also included in the package. 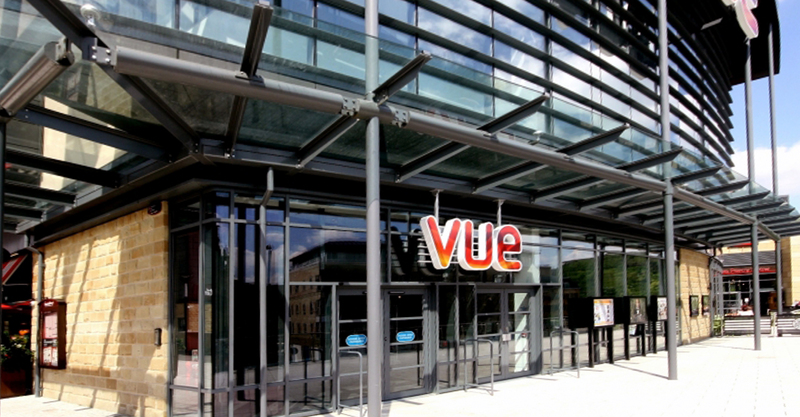 The glass canopy outside of the Vue cinema was entirely different to its adjacent installations as it fitted around the facet. Arkoni founder and MD Mark Prentice commented: “We were delighted to be involved in such a landmark development featuring some of the UK’s most prominent leisure operators. “The original architectural designs had to be adapted due to budgetary restrictions but Arkoni’s cost effective, engineered solutions fitted the revised brief without compromising on the overall appearance and the architect’s vision. “It was especially pleasing given that it’s within our own locality and many of our employees already make use of the venue on a regular basis including myself. Our craftsmanship and expertise is in evidence at many similar venues up and down the country and we work with many architectural practices to deliver safe, modern and useful features such as canopies. We were on site for almost a year, on and off, immediately prior to the opening of Broad Street Plaza utilising our own crawler crane on-site,” added Mark.